A large meteorite exploded in the sky over the region of Khakassia in Southwest Siberia on Tuesday, November 6, 2016. Many people witnessed the moment the fireball turned the evening sky into day. The fireball did not reach the earth and burned up in the dense layers of the atmosphere above Sayanogorsk. 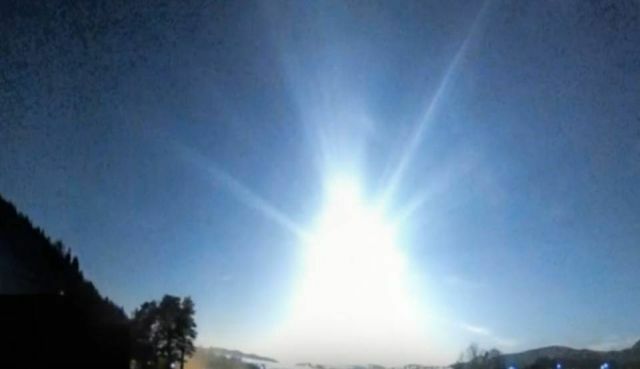 The bright flash of light was seen for three or four seconds in different regions of the country, however the sound of the explosion was about 30 seconds later. It seems another large meteorite exploded at about the same time over Norway, according to BPEarthwatch who explained that these meteorites are possible debris from the asteroid 3200 Phaethon, which is an Apollo asteroid with an unusual orbit. Below are two videos of the fireball over Russia. In the third video BPEarthwatch informs us about the fireball over Norway and the asteroid 3200 Phaethon.